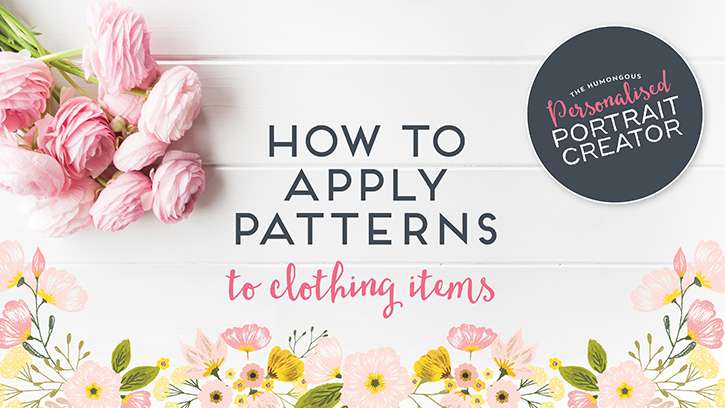 This quick Adobe Photoshop tutorial shows you how to apply patterns to clothing items to your Personalised Portraits. The clothing items are well marked and organised into their own layers, which means you can easily and quickly apply one of the many patterns to the clothing items supplied with the Personalise Portrait Creator kit. What if I just want a solid color and not a pattern? Well, my goodness! Thanks for this tutorial. I’m new to designing. Thank you! Can you change the size of a pattern? For instance, I noticed that on the men’s patterned sweater, the pattern is much smaller by default than if I click that same pattern in the swatches, I’m using Illustrator. Yes absolutely 🙂 To change the size, make sure you only have the object with the pattern selected. Then go over to Menu > Object > Transform > Scale. In the pop-up box, make sure you have preview ticked on so you can see the adjustments. Then type in your percentage in the Uniform block (you’ll have to experiment with the amount until it’s the size you’d like), and under Options make sure you ONLY have the Transform Patterns ticked – this will scale the pattern only and not the object itself. Hope that helps! How do you change the colors or pattern of the pets ? Hi! If you’re using the Adobe Illustrator version, you can edit the pets quite easily as vectors are far more flexible. The PNG version on the other hand are unfortunately not layered but supplied as flat files due to the collective file size of the product. I am looking into finding a way to make the pets more editable in Adobe Photoshop for the future. In the meantime you could use the brush tool and erasure tool in Adobe Photoshop to make adjustments to the markings. You could also use the Select > Color Range to select certain colours of the pets and then use the Hue & Saturation to adjust that. Hope that helps! Hello! I have a question regarding adding a pattern. For example, if I want to change the pattern of the women’s wooly scarf, when I follow your instructions, I lose the fold details of the scarf. It fills in the entire area and it no longer looks like a scarf. Does that make sense? How do I keep the details (folds,creases) of the item while changing the pattern? Thank you! Hi there! For some of the smaller items, the editability is slightly more limiting – I’ve had to do that to keep the file size manageable for better end-user experience. So in the case of the wooly scarf, it is in fact one flat layer meaning, the definition and scarf colour are on one layer. But there is a work around. Make sure you’re on the the wooly scarf layer, then go to Select > Color range. Make sure you have Sample colors under the Select option, then with the eyedropper, click on an area thats the definition of the scarf. Take the Fuzziness up to about 36 so that you are including all the line definition pixels. Then click ok.
You should now have a selection of just the definition lines. Now copy and paste the selection, a new layer will automatically be created, rename it to be “Wooly scarf outline”. This is now a new layer with just the outline. You can then go ahead and fill the original wooly scarf layer with your pattern and you should still have the outline definition preserved on a new layer which you can recolor to suit the new pattern you’re using. Hope that helps! If you have any other questions at all, please don’t hesitate to let me know.